Benefit performance by Where’s Aubrey, with a guest appearance from the The Bitter Liberals! Ring in the new year, enjoy some special holiday refreshments, and help support clean water in Clarke County while you enjoy the always entertaining and inventive sounds of Where’s Aubrey at Barns of Rose Hill on January 3, 2015. Special appearance by the The Bitter Liberals! Doors open at 7:30; concert begins at 8:00. 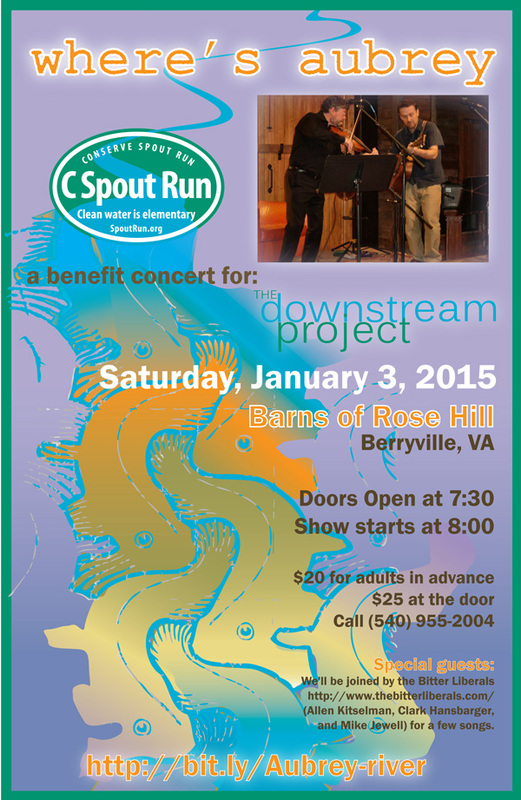 In a true community effort, the C Spout Run partners have been working since 2012 to help remove Clarke County’s Spout Run from Virginia’s impaired waters list and restore brook trout habitat. Come and learn more about this ongoing project and what you can do from representatives of Trout Unlimited, The Piedmont Environmental Council, Powhatan School, Lord Fairfax Soil and Water Conservation District, Friends of the Shenandoah River, Clarke County, and The Downstream Project. Learn about BMPs (best management practices), financial incentives and cost-share programs for everything from livestock fencing to septic repairs and maintenance—existing programs available to Spout Run residents that will go a long way to help protect our water. Learn about rain gardens and rain barrels and volunteer opportunities for water monitoring and tree plantings. Many thanks to the duo behind Where’s Aubrey, Gary McGraw and Rhine Singleton, for donating their time and talent and proceeds for this concert to raise money and awareness for the C Spout Run project. All of their live concerts have been benefits for nonprofit endeavors; they are proud to give back to the community and are grateful to their generous fans. Where’s Aubrey has played together since 1985, writing and performing all original music since the turn of the millennium. Rhine Singleton’s original songs, cloaked and hooded by Gary McGraw’s improvisation on the fiddle and mandolin, range from old-timey folk music through modern jazz. Special Guests: The Bitter Liberals (Allen Kitselman, Clark Hansbarger, and Mike Jewell) will join Where’s Aubrey for a few songs. Ticket available online now at The Barns of Rose Hill website. $20 for adults in advance, $25 at the door. It was a crisp November morning and over 20 volunteers from Clarke County and the surrounding community gathered on the banks of Spout Run to plant over 150 native trees and shrubs to improve habitat and do their part to restore this unique spring creek. On the heels of the stream restoration work completed in May, this volunteer tree planting was one of the last steps for this targeted restoration project on Spout Run near Carter Hall. Passionate volunteers young and old, including many TU members, enjoyed getting their hands a little dirty to make a difference for clean water. Thirteen species of trees and shrubs—all native to VA—were planted including American hazelnut, pin oak, black gum, and red osier dogwood. Prior to this project, this reach of Spout Run suffered from unstable streambanks and signification streambank erosion. In the long term, the streambank stabilization and instream habitat restoration activities completed in May will be successful once a riparian buffer is established. Permanent rooted vegetation along streambanks is the most important factor for stream stability in the Shenandoah Valley. The trees these dedicated volunteers planted will help hold the streambanks in place, provide shade to the stream and cover for native brook trout. Funding for this project was made possible by a grant from the Environmental Protection Agency and the National Fish and Wildlife Foundation, with support from Rapidan and Winchester Chapters of Trout Unlimited, and Project Hope. Richard Farland recently completed a conservation project on his farm along Page Brook. The two hundred acre farm is home to a cow-calf operation. In partnership with the Lord Fairfax Soil and Water Conservation District, Mr. Farland has fenced the livestock out all 2,360 feet of Page Brook. An additional 1,237 feet of wetland was excluded. The 8 acres of riparian buffer have achieved complete sediment reduction. A potentially record-breaking and damaging storm surge came down Spout Run earlier this month along with monsoon rains, just two days after this restored reach of Spout Run at Carter Hall spring below Millwood had been staked and seeded. The Downstream crew joined stream restoration specialists, Seth Coffman and James Fulcher from Trout Unlimited, to document how well the site and intended improvements held up. It is estimated that over 130 cubic yards of sediment were deposited over the newly established flood plain area and kept from washing further downstream to the Shenandoah River and ultimately the Chesapeake Bay. We love it when a plan comes together. Congratulations to Seth and James for a great design and execution. Stream restoration specialist, Seth Coffman, from Trout Unlimited describes progress on the first targeted streambank restoration project on Spout Run, just below Millwood and the Carter Hall spring. 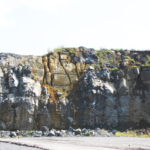 In May of 2013, we captured video of Seth and James Fulcher recording topographic information as we witnessed the severity of the vertical and incised banks which contribute heavily to the sedimentation of the stream. The before-and-after segments in the latest video journal entry show the remarkable improvement and future benefits of this work in progress. How does nitrogen get in the streams of the Shenandoah Valley? Spout Run watershed was a case study in this FOSR 2013 report from Clarke County, Virginia which indicates that springs located near fields or areas where biosolids have been applied have higher Nitrate concentrations than those springs located in areas where biosolids have not been applied. This study was conducted by Friends of the Shenandoah River with cooperation of Clarke County and the willingness of landowners who gave access to the springs. Funds for the study were granted to Alison Teetor by the 2013 Citizen Water Quality Monitoring Grant Program, from the Virginia Department of Environmental Quality, and from the Chesapeake Bay Restoration Fund. Chemical analyses were conducted by Karen Andersen and Molly Smith. Ben Sawyer performed GIS measurements and helped with hydrologic analyses. John Young USGS Leetown, WV loaned a stream flow meter. Richard Marzolf helped write this report. Spout Run is a type example of a karst watershed in Clarke County in the Shenandoah Valley. 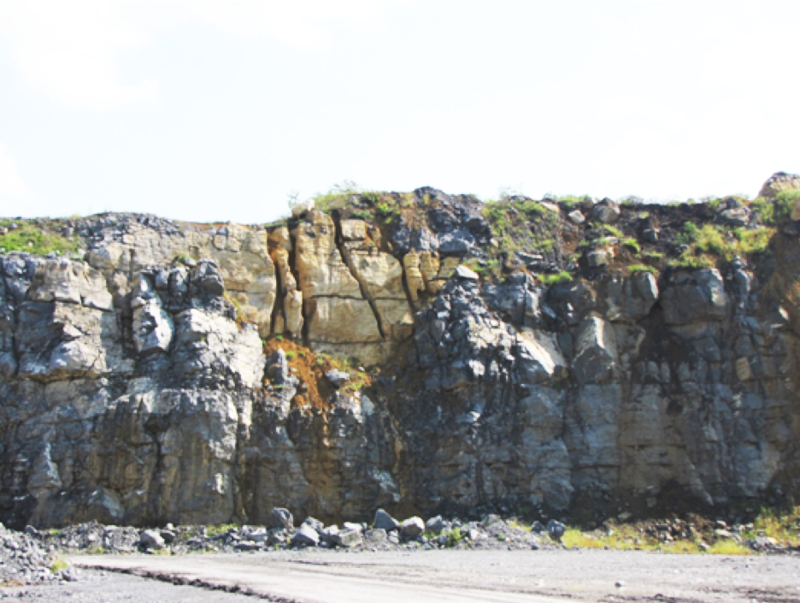 Its drainage basin of 21.4 square miles is entirely karst (carbonate); with characteristic fracture zones, frequent sinks and springs and fewer surface streams than the adjacent less permeable metamorphic and siliciclastic formations. Flow from springs is nearly a direct connection to the ground water; that is, ground water, emerging to the surface in spring flow, accounts for up to ca. 80% of the stream flow. Precipitation infiltrates rapidly with only 2- 4% of rainfall appearing as runoff, and, depending on vegetation and season, up to 70% of rainfall is returned to the atmosphere by evapotranspiration. The upshot of this hydrogeological configuration is that base flow is sustained and flood peaks are muted. The central purpose of the study was to examine the role of ground-water transport of nutrient constituents of biosolids when they were applied to lands near springs. A general finding of the chemical analyses was that changes through time were minor in any one spring; while the differences were observed to be among the various springs. Generally the nitrogen concentration was higher in spring flow from springs proximal to biosolid application areas. Total Kjeldahl nitrogen (organic), ammonia and nitrite concentrations were below the limit of detection. 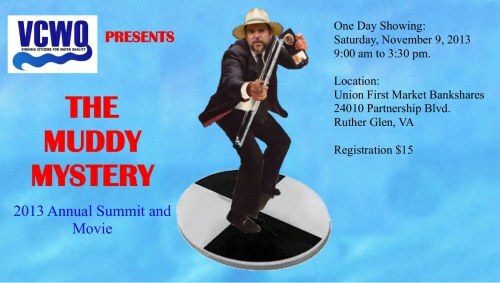 Virginia Citizens for Water Quality (VCWO) presents “The Muddy Mystery” —2013 Annual Summit and Movie, (Union First Market Bankshares, Ruther Glen, Virginia) – November 9, 2013. Join our project team representatives Nesha McRae (VADEQ), Seth Coffman (TU), and Bill Howard (The Downstream Project- TDP) who will be presenting a keynote address—C Spout Run: Inspiring Successful Watershed Planning in the Shenandoah Valley. Learn and enjoy from other partner groups and the state offering presentations focused on uncovering the mystery of runoff pollution. Registration is now open! $15 includes lunch and refreshments. Check out the draft agenda by clicking –> here. Questions? Contact Anna Mathis at amathis@allianceforthebay.org or 804-775-0951.